A girl becomes the image of her mother, a child fulfills the heritage carried in blood. My mother used to tell me that each fizzle through the dark sky was another fallen angel coming to join us. It was not hell in those days but perhaps it is now. I remember sitting beside her on the ragged cliffs, her knee long hair flicking around her like a dark cloak, her face hidden from me so I could never guess what she was thinking or feeling as she stared into the horizon. 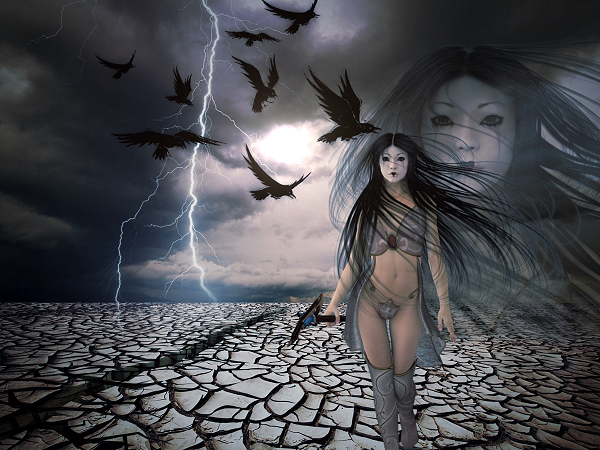 Lightning struck in the distance, thunder growled, she weathered a storm inside herself she would not speak of to me. I tried to pull closer to her, reaching to hold her thin claws, but her coldness was a veil I couldn’t part. She was banished here, that much I know. And when she left she damned me to her own fate.